We are facing the upcoming League of Legends World Championship 2018 and the betting providers are presenting their odds for the event. The bookmakers have already calculated exactly which teams stand a chance of winning the World Championship title. The question remains which of the favourites will win. South Korea, as host of the World Cup, will of course do everything in their power to win, but the European teams showed also their tactical improvement in their approach to the tournament. 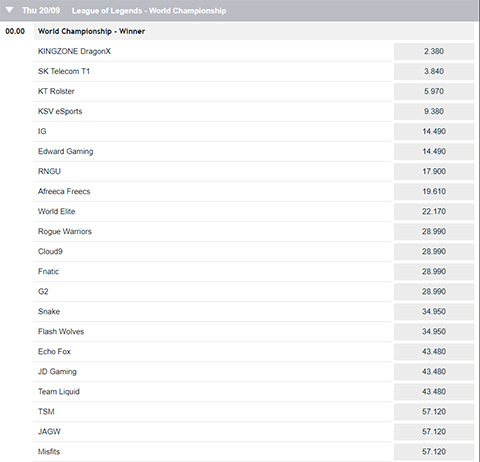 So far only bet365 and Pinnacle offer odds for the LoL Worlds 2018, as soon as other bookmakers follow them, you can find their betting options here. Detailed information about all bookmakers can be found in our eSports betting sites overview. So far there are three special bets on the LoL Worlds 2018 and the participants and schedules are not yet fixed, so at the moment only very general odds can be offered. You can bet on the outright winner of the tournament, which region the winner comes from and whether Kingzone DragonX or another team wins the LoL World Championship. As the name suggests, this LoL World Cup 2018 bet is all about betting on which team will be the next League of Legends World Champion. None of the teams listed are certain whether they will be allowed to participate in the tournament at all, as the Summer Split will be the first information about this. Of course, South Korean teams are once again favourites. 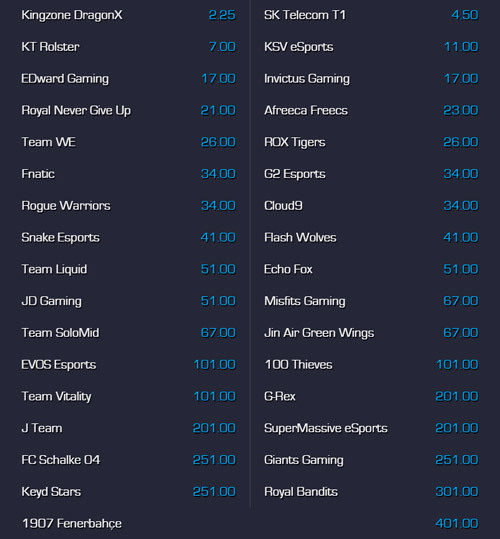 The eSport bookmaker bet365 and pinnacle currently offer odds for 32 teams. *Please notice. Odds shown may have be changed in meantime. Follow the links to take a look at the current betting odds. This betting option is a little less risky, as South Korea is still the region with the strongest LoL teams and will most likely be the region of the new world champion again. With Kingzone DragonX, SKT T1, KT Rolster and KSV-ESports, the four biggest favourites for the title play in the LCK. This option is used to determine whether a team (the favorite) wins the tournament or one of the many other teams. In the past years it was mostly SK Telecom T1, but this time Kingzone DragonX is the biggest favourite. The odds for the field of participants are quite attractive, as KD will encounter many obstacles on the way to the title. *). Please notice. Odds shown may have be changed in meantime. Follow the links to take a look at the current betting odds.